A vital component of the Willamette Falls Legacy Project is the restoration of native habitat at the project site, taking an approach based in science. Our project isn’t the first to prioritize habitat restoration along with other key considerations such as public access, tribal rights, economic development and historic sites. Similar to the examples of waterfront revitalization we shared in February, we are highlighting several inspiring examples of waterfront habitat restoration projects. Sydney’s recently-completed Barangaroo Reserve park is a stunning example of shoreline restoration. 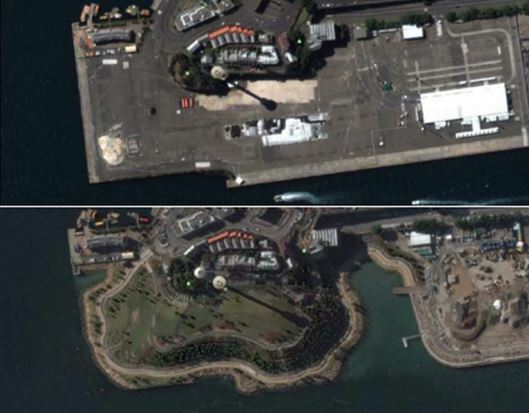 Before its transformation, Barangaroo point was the site of a shipping container yard offering no public access. After its transformation into Barangaroo Reserve, it is now a natural area abundant with native vegetation offering habitat for birds and marine life as well as public recreation. The reserve’s design is modeled after a headland dating back to the early 1800s. Barangaroo Reserve offers separate waterfront paths to provide recreational opportunities for both pedestrians and cyclists, with more secluded walking paths in the park’s interior. The park also contains a large underground cultural space including a parking garage, which is used for community events and festivals. As part of the shoreline restoration, ten thousand sandstone blocks were taken from the site and placed around its perimeter in a stepped pattern to create tide pools and marine life habitat, while also allowing visitors an opportunity to connect with Sydney Harbor. Sandstone blocks were weathered using water jetting and placed around the reserve's perimeter. Photos courtesy PWP Landscape Architecture. The Minneapolis RiverFIRST initiative is a long-term vision to enhance more than five miles of Mississippi riverfront over the course of two decades. The project’s design includes a set of interconnected riverfront parks that connect in turn with regional or national parks, trails and byways. One of the project’s signature parks is Waterworks Park, adjacent to St. Anthony Falls, which is the only true waterfall on the river. One key goal of the park’s design is to increase recreational opportunities, including an outdoor ampitheater, outdoor rooms, a pavilion, improved bike paths and pedestrian river access. Two other key goals are to improve stormwater management and protect historical monuments. 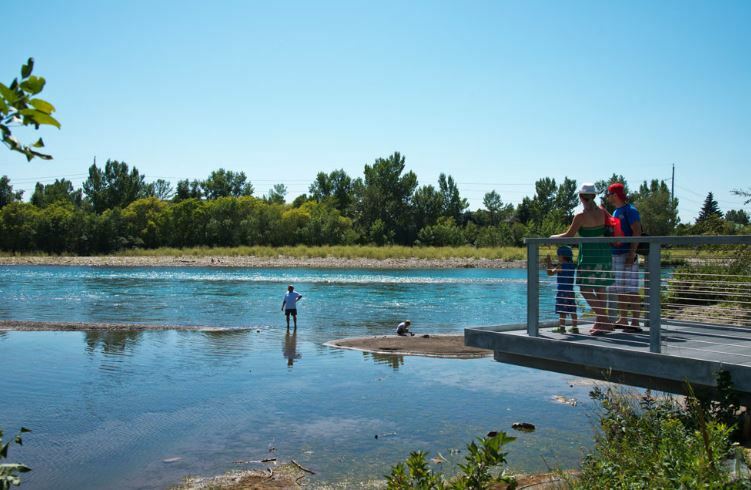 Though it is a common perception that habitat restoration means removing humans and their traces, St. Patrick’s Island, a 31-acre island park in Calgary, is an excellent example of the value in connecting people with natural habitat. The master redevelopment plan for St. Patrick’s Island, was based on the principles of “biophilia” – a landscape design approach that nurtures the instinctive bond between people and nature, and encourages the connection and restoration the relationship may produce. One of the overarching goals of the project was to enhance and preserve habitat. This goal was achieved through design features including a lowland channel to provide habitat for aquatic creatures and a gallery forest to provide important habitat for nesting eagles, owls, and songbirds. The gallery forest features an elevated boardwalk, allowing visitors to enjoy the forest without impacting habitat. The Cove provides river access at the southeast end of the island. Photo credit Julya Hajnoczky, Avenue Calgary. 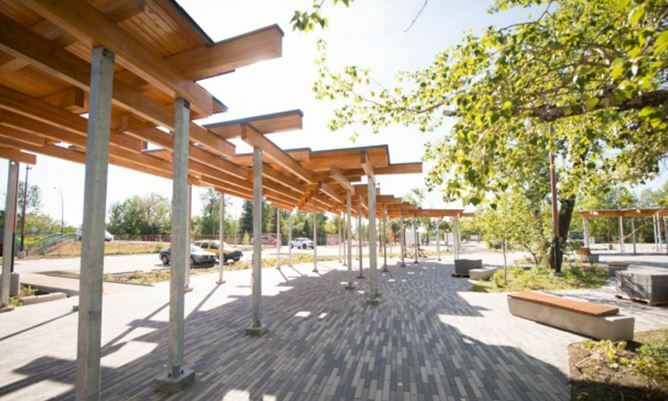 A second overarching goal was to enhance public access, which was achieved through the creation of a network of pathways to provide pedestrian, bicycle and snowshoe access, a picnic grove, a cove that provides access to the Bow River for fishing and rafting and Confluence Plaza, a small amphitheater for concerts and gatherings. Confluence Plaza has an ampitheater and seating for concerts and events. Photo courtesy Calgary Municipal Land Corporation. Willamette Falls is home to a continuous, evolving connection between people and nature. The Willamette Falls Legacy Project is striving to create a legacy of connecting people and nature and a model of habitat restoration based on conservation science. To read the complete versions of these case studies and others, visit our document library.